Let us begin our story in Kansas City, at the Republican National Convention in July 1976, the nation’s 200th birthday. Ronald Reagan, the former two-term governor of California, decided to challenge the unpopular President, Gerald Ford, who had angered a good many citizens by pardoning Richard Nixon before any charges had ever been brought in the Watergate case. His foreign policy was also a disaster, allowing South Vietnam to fall to the North without any response and signing the Helsinki Accords, essentially handing the Soviets control of Eastern Europe. Reagan, seeking to give Republicans a conservative choice, stumbled out of the blocks during the early primary season, losing the first six contests, but he roared back in North Carolina and Texas, as well as other more conservative Southern and Western states. Arriving at the convention, neither candidate had a majority of delegates. In order to win the nomination, the uncommitted delegates would have to choose a side, and both camps heavily lobbied them. National attention, though, focused on Mississippi, as its delegation, led by Clarke Reed, adopted a “unit rule,” whereby the entire voting bloc would swing to one candidate based on the majority vote of the delegation. So, in other words if 16 of the 30 delegates voted for Reagan, the whole 30 vote bloc would go to Reagan. This was a major prize for each camp. It was widely believed that Mississippi was solidly in Reagan’s camp. However, Reagan did make a strategic mistake, although not a catastrophic one. He picked a liberal Republican Senator from Pennsylvania, Richard Schweiker, to be his running mate, hoping to pick up that state’s crucial delegates. This caused anger among many conservatives, who began switching to President Ford. Perhaps the major blow was the day Congressmen Trent Lott and Thad Cochran publicly endorsed the President over Reagan. Cochran even flew with the President on board Air Force One back to Mississippi to parade in front of the cameras for the general public. Clarke Reed also switched his vote and the Mississippi delegation went for Ford, as did the convention. But it didn’t have to be this way. The Schweiker pick was bad on Reagan’s part but that did not mean the convention would have supported it. Furthermore, in exchange for the nomination, Reagan could have been pressured to drop him. Even the Clarion Ledger called Schweiker a “potential” VP pick. But it was not to be. Mississippi’s so-called conservatives, led by Cochran, supported Gerald Ford, a moderate, and awarded him the presidential nomination. Most historians and political scientists, of either political stripe, have credited Mississippi with tipping the balance away from Reagan and toward Ford. And Barbour proved correct, as Ford lost to Carter in a close race, with Carter even winning Mississippi, the last time a Democrat won the Magnolia State. One Reagan supporter in Mississippi said it best, “We would a whole lot rather have Reagan with Schweiker, than to have Jimmy Carter. And most of us perceived Reagan as the only person who could beat Jimmy Carter.” And thanks to Thad Cochran’s help, the nation did not get a true choice in the November election, and was given four years of President Carter. As we know, Reagan came back in 1980 and took on Carter, trouncing him in November 1980 by carrying 44 states. Moving into the White House in January 1981, President Reagan sought a new era for the nation, one centered on conservative values. He had two main goals: balance the budget and build up the nation’s lagging defenses. But with the first of these, he struggled against a recalcitrant Congress to rein in federal spending. Thad Cochran, though, was no help at all. Now in the Senate, controlled by Republicans, Senator Cochran sided with Senators on both sides of the aisle who supported big government and more spending. Conservatives in the House and Senate took aim at the federal budget early and often. In the fall of 1981 conservatives proposed a cut of 5 percent at the Interior Department, 2.6 percent at the Agriculture Department, and 4 percent at Transportation. Senator Cochran voted against all three bills. The year 1982 proved to be no better for Thad Cochran, as he voted with moderates and liberals of both parties to increase the debt ceiling by $1.2 trillion. That’s nearly $3 trillion in 2014 dollars. In 1983, he supported a $25 billion bailout for the Department of Housing and Urban Development. In another bailout effort, he voted in favor of the 1983 Social Security bailout bill that included $100 billion in new Social Security taxes. Congress also agreed that year on specific deficit targets, and to ensure those targets were met, a bi-partisan effort emerged to empower President Reagan to impound appropriated funds of up to 20 percent on federal programs if Congress failed to cut spending to meet the targets, but Cochran voted against it. And when an amendment was brought to the floor to freeze domestic spending, Cochran voted to kill it. In 1984 budget hawks proposed an amendment to cut federal spending across the board by 10 percent. And Cochran voted no. In 1985, in yet another attempt to get controls on spending, a bill authored by Bob Dole would set budget targets, eliminate more than a dozen federal programs, and allow defense spending to be indexed to inflation. Senator Cochran voted to kill that plan too. 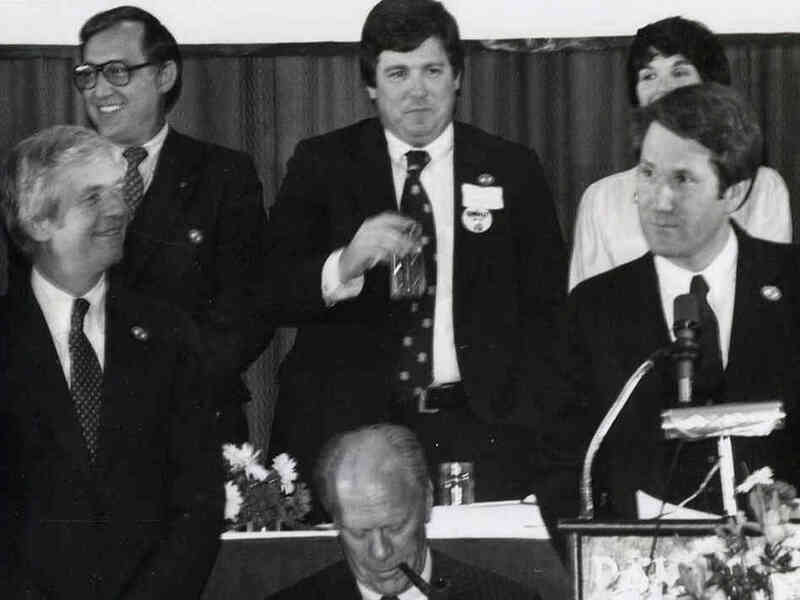 Also in 1985, Congress passed the Gramm-Rudman-Hollings Deficit Reduction Act, which Senator Cochran supported. However, the next year, 1986, Cochran supported an increase of over $1 billion for farm programs even though it would have busted the budget limits set by Gramm-Rudman law. But legal budget limits meant very little to Senator Cochran, as later that year he supported a budget that increased domestic spending and ballooned the budget deficit to over $200 billion (more than $425 billion today), a time when the federal budget was less than a trillion dollars. Reagan tried many times to control runaway spending. But by 1987, Democrats controlled both houses of Congress. And that year they passed an $88 billion highway bill (over $181 billion in 2014 dollars) filled with pork barrel earmarks. President Reagan immediately vetoed it, angering the big spenders, who vowed to override it. Reagan traveled up to Capitol Hill to personally lobby members of the Republican delegation to sustain his veto. Meeting with Senator Cochran, the President said, “I beg you to vote with me on this.” But Cochran turned his back on Reagan yet again, joining the liberal Democrats in overriding the veto. And Cochran is no stranger to liberal anti-poverty programs either. Also in 1987 he supported a $1 billion (over $2 billion today) spending bill to assist the homeless. When budget hawk Phil Gramm authored an amendment to remove tax increases from a budget bill and cap spending at 1987 levels, Senator Cochran once again voted to kill it. And when Reagan asked for the line-item veto that year, Cochran was against that budget-cutting measure too. Despite all the obstruction, Democrats still argue how Reagan and the Republicans ran up the debt in the 1980s, but in reality it was the Left, along with the help of liberal Republicans like Thad Cochran. But that’s not all Senator Cochran is guilty of. He was not an avid supporter of all of Reagan’s efforts to maintain a strong national defense, protect our borders, or to protect the unborn. In 1982, for example, he voted for amnesty for illegals. Three times in the 1980s, as pro-life conservatives fought for the rights of the unborn, he voted against amendments that would have cut the use of federal funds for abortions in the District of Columbia. In matters of defense, Senator Cochran voted to cut $80 million from the Titan missile program in 1982 and voted against increases in the MX missile system and the new “Midgetman” missiles that President Reagan wanted as part of his defense buildup. In 1982, in the same amendment that would have frozen domestic spending, Cochran voted against an increase in defense funding, as part of the Reagan Buildup, by 7.5 percent. In 1983, Cochran voted against a Jesse Helms amendment to sanction the Soviets after they shot down a Korean civilian airliner that year. He also voted for an intermediate-range nuclear forces limitation treaty in 1988, which conservative groups opposed. As you can see, there is no reason to believe Thad Cochran is a Reagan Conservative, despite the spin from his enthusiasts. So, when Cochran and his supporters try to convince you that he is a Reagan Conservative, ask them where he was in 1976. Ask him about his votes on spending in the 1980s, as well as his support of Reagan’s defense buildup, a policy that won the Cold War. And ask him if he has been steadfast in defending the unborn. For the real proof is in his record. A Note on Sources: All quotes concerning the 1976 national convention were taken from the book Mississippi Politics: The Struggle for Power, 1976-2006 by Jere Nash and Andy Taggert (Jackson: University Press of Mississippi, 2006). This entry was posted in Conservatism, Fiscal Policy, History, Politics and tagged 1976 Republican National Convention, fiscal conservatism, Gerald Ford, Jimmy Carter, Mississippi, national security, Presidency, Richard Schweiker, Ronald Reagan, Thad Cochran. Bookmark the permalink.